Happy April Fools Day everyone! I hope everyone had/is having a fantastic Easter weekend. Sadly I got slammed by work and a 24 hour flu while trying to go on a mini road trip for the weekend. Today’s page is part of another Team Stryker double-header as I didn’t have internet on Friday. I’m happy to report that I got my internet all set up yesterday so I should be able to bring you your tri-weekly dose of Team Stryker on it’s regular schedule. Thanks to everyone for being understanding and patient while I moved and hopefully you all agree that Mission 004 has been worth the wait! 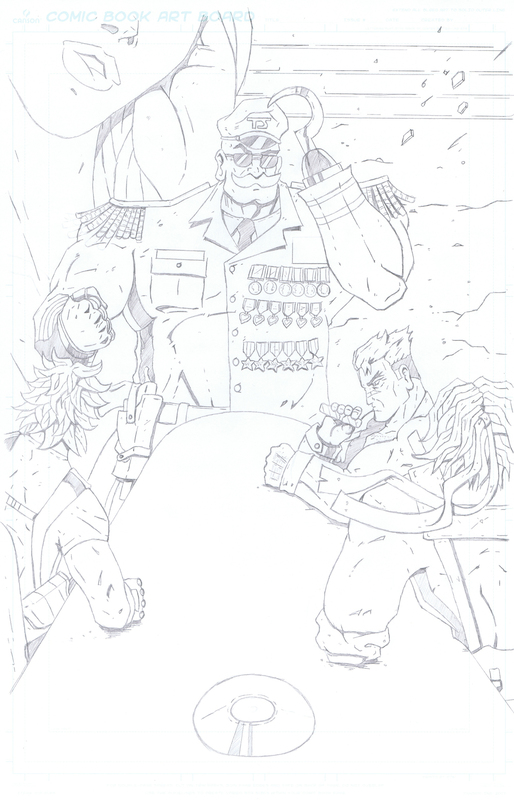 Today’s page was a great exercise in trying to show the power behind General Strongbottom and why he should be the one to command Team Stryker. He is my widest character to date so getting him, Eagleheart, Deadeye, and Casanova on one page required a lot of pre-planning. I want SB to come off as senile-yet-deadly which can’t always be an easy thing to pull off. If I make him too senile people will question why is he still running Team Stryker, but if I make him too powerful the question becomes why isn’t he out in the field? It took several pages of sketches to get him to a place where I was happy with the final design. What do you think of your first close up encounter with General Strongbottom? Have a great start to the new month and don’t go anywhere as part 2 of your Team Stryker double header is right around the corner!